Your data has power. We unleash it. Your digital is cold. We humanize it. experience&co is a digital consulting agency that partners with large global enterprises. We combine data science, human centered design, advanced technology and business strategy to deliver truly effective digital business transformation. Brilliant people & bleeding-edge capabilities. That's how we deliver our offerings. 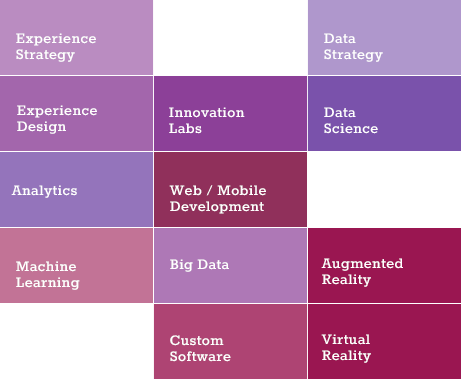 Our strategy and management consultants are joined by top-notch data scientists and data analysts, big data engineers and architects, machine learning experts, user experience strategists, visual designers, and web, mobile and augmented reality engineers; to name a few. This rare combination of expertise is at the heart of our success and yours. Our approach? It starts with strategy and ends with success. We know you've tried to harness your data before unsuccessfully. We know you've built sub-par web and mobile apps too. That's' why we start with strategy first, developing data and experience strategies unique to your brand, industry and market. These powerful strategies are front and center in our process before, during, and after solution delivery and ensure everything we do is in the context of your end goals. We call our solution development process data-driven and experience-led. Harnessing the hidden value deep within your data to deliver effective, enjoyable, and personalized experiences across all brand touch-points is how we help you achieve success. We harness the power of your data to drive personalized, effective human experiences. And success means actually achieving your business goals. Digital transformation isn't a business goal, it's a byproduct of success. Don't just transform or disrupt for the sake of it. Achieving your actual business goals in an innovative, measurable way is what drives any transformation we deliver. 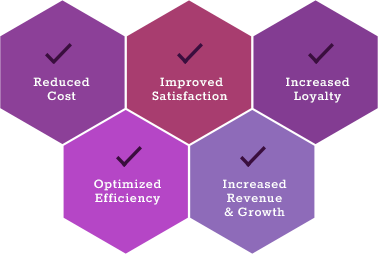 Bottom line, top line, employee engagement, customer loyalty or competitive advantage; these are why we do what we do. We brought together brilliant minds from top digital & management consulting firms globally to lead experience&co. We told them to rethink the how, what and why of data, design and digital transformation and its impact not just on businesses, but on people. We're different. See how experience&co can help you transform.